Please Join Us in Celebrating Our 23rd Anniversary! My Mothers Buttons showcases one-of-a-kind jewelry featuring exquisite French buttons and buckles from Paris's opulent 1800's era know as La Belle Epoque. Owner Linda Wright brings her unique sense of style and a curator's eye to the designs that she creates for her company. 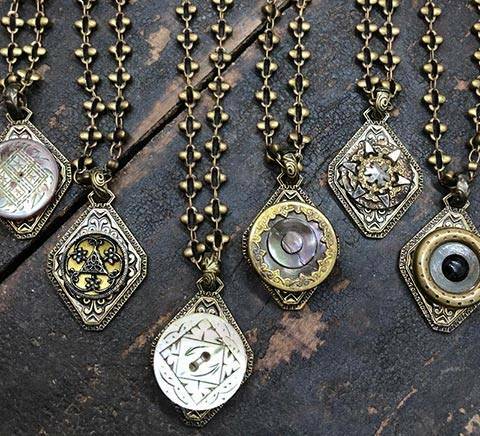 Linda loves the industrial look of chain and how it contrasts with the antique elements in her pieces. The result is a modern twist with an antique flair. My Mothers Buttons can be found in stores and museum shops across the United States and Europe with a loyal following of jewelry lovers with a discerning eye.